Ex Cuem was founded by a group of students at the University Statale di Milano. 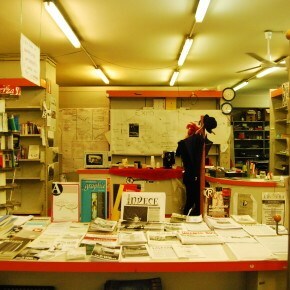 They reopened the CUEM, an independent 40 year-old bookshop that went bankrupt in October 2011 due to debt and false accounting, closing its 150m2 premises. CUEM’s closure created a monopoly for the sole remaining university bookshop, CUSL, well-known for its connection with the right-wing political and Catholic movement Comunione e Liberazione. The occupation had many reasons: to provide and exchange cheaper books and lecture notes, to use a big open space for free circulation of critical knowledge, for study and cultural events or meetings, and finally to prevent the waste of space and skills. The space was run non-commercially by volunteers, with open weekly meetings and frequent events like book presentations, movie nights and political debates. Shortly after its first year of occupation, on April 16th, the dean of the university, Gianluca Vago, decided to evict the students. Vago explained his act as a response to “an escalation of irresponsible acts performed with arrogance by a violent minority”: that means that some students interrupted the board of directors of the university and used to host unwanted events at ExCuem. He added that he wanted to “give it back to the students with a regular tender”. During the eviction furniture and walls were damaged. As a response, the students occupied a smaller room. At that point, on May 6th, the dean called the police who, for the first time in the last thirty years, forcibly removed the students from the university. Shortly after, the hashtags #VagoDimettiti (Vago resign) and #StandUp4ExCuem appeared on twitter. Many asked why the dean had only now, one year after the closure, started to express so much interest in the bookshop. Others pointed to the weird concept of justice where an open, free and self-organized bookshop promoting the right to education is considered illegal, while rooms lying empty are perfectly in harmony with legality. The scanning of books, helping students to save money, was also deemed illegal. The wave of indignation led to a demonstration in Milan, attended by hundreds of students, and smaller solidarity demos in Naples and Rome. Finally, on May 8th, books were returned to ExCuem, now reoccupied by students. Even though the police blocked the entrance to the university, the students managed to pass books in through the windows. These events must be seen in connection with the eviction of Bartleby in Bologna, another independent university space producing knowledge beyond commercial boundaries. Bologna, once a city of culture, is now a city of evictions. For many years, the city of Bologna has been an icon of good administrative practice and culture. After 50 years of almost uninterrupted left-wing governments (first under the Italian Communist Party, then under the centre-left parties PDS, DS, PD), Bologna formed the core of the so-called ‘Emilian model’, universally admired from outside the region. A lively system of production, led by cooperative societies, and cutting-edge social services seemed to be the main strengths of this model. However, although it produced an enviable level of wealth, the model was not as perfect as it seemed. Its real basis was the Communist Party, which acted as the hidden propulsive force behind the economy, controlling thousands of jobs through a network of giant cooperatives. The Bartleby collective has been an important venue in the city centre since 2008. After several occupations, the collective eventually signed an agreement for its current premises with the University, an agreement that expired late in 2012. Bartleby’s positive role in the cultural life of the city has been generally recognised and praised. It has also received an outstanding endorsement: soon before his death, the illustrious poet and former partisan Roberto Roversi donated his private collection of magazines to the collective. This collection is now inaccessible, hidden behind a newly erected wall. In the early hours of January 23, the main entrance of Bartleby was bricked up as a police contingent called by the University prevented access to the sealed premises. According to the University, the premises are expected to be renovated shortly. As the collective and its many supporters claim, this was rather a carefully orchestrated action to remove the collective from Bologna’s historic centre, eliminating one of the few free cultural venues still in existence in the city. Professors, intellectuals, nationally known arts and cultural organisations such as the Teatro Valle, and locally high ranking members of the CGIL union have all expressed their support of Bartleby. The eviction of Bartleby is not an isolated incident. Over the last month, about 50 people in need of homes (collectively represented by the independent union ASIA-USB) were evicted twice from some empty public buildings. The residents of the neighborhood had looked favorably upon the occupation as it brought the buildings back into use again. However, the local authorities proceeded with the evictions, despite the bitingly cold winter temperatures. Only one family with three children has currently been allocated housing; the remaining evicted people were directed to emergency places in the city hostels for homeless people. The demand for affordable housing (‘case popolari’) has increased by 82% over the past year. Of recent applicants, 70% currently live in private housing whose rent takes at least half of their income. More than one in ten new applicants have no income at all. Also under threat of eviction is Atlantide, home to several local LGBT and feminist collectives since the mid-nineties. According to the local council, their current venue (an old building near the city centre) is to be reallocated to an association promoting environmental awareness. The exploitative angle of such a decision did not go unnoticed by many local associations, such as TPO, ArciLesbica, Orlando, and many national feminist and LGBT groups. Administrators continue to present Bologna as a city of ‘good administration and welfare’, claiming historical continuity with the ‘Emilian model’, yet a local councillor has recently proposed charging for the use of children’s public playgrounds. And for those political people seeking to address the lack of housing, cultural space, or free social spaces in the city, evictions are currently the only answer. text [it] Il Fatto Quotidiano: will parents have to pay for the use of playgrounds? Posted on May 13, 2013, in Europe and tagged Evictions, Italy, Squatting. Bookmark the permalink. Leave a comment.